The Adventures of the Everyday Fangirl welcomes author Adam Bray to talk about his latest project for DK Books, Ultimate Marvel. Welcome Adam to The Adventures of The Everyday Fangirl and thank you for taking the time out of your busy schedule to answer these questions about the recently released, Ultimate Marvel! What interested you most about working on this project in comparison to working on other DK Projects? It’s always fun to work on something new and different. This is my second Marvel book. It takes an exhaustive look at the entire library of Marvel comics and characters, so it was a chance to explore all of canon and learn a lot. It’s also nice to work on these big books because it means I’m guaranteed to have work for a good chunk of the year without having to hunt for new projects! I was very surprised that this reference book was only references the comics and not the MCU Movies and TV shows. Was this always intended or did this come up during the process? It was always planned to only cover comics in this book. I don’t think DK has published any books about the movies or TV shows yet, but hopefully they will some day. However, I did make sure we added characters from the Agents of Shield series to this book, since they have appeared in recent comics, and I am a big fan of the TV show! What areas of this book did you work on? With such a big book, I think all 4 of us contributing authors worked on a wide selection of characters, locations, weapons, technology and other items. 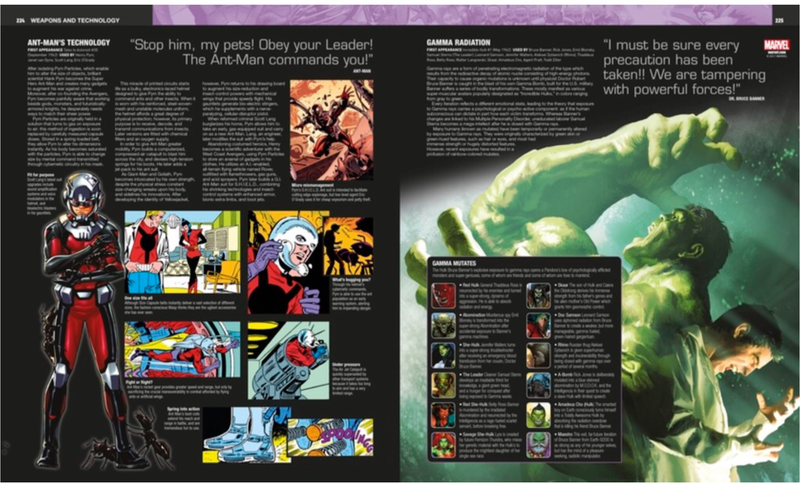 I wrote sections about the Avengers and core characters like Ant-Man, Captain America, Hawkeye, all things Spider-Man (apart from his main character entry, which was written in-house at DK as the original sample spread) and Daredevil. And of course I’m a fan of the Netflix series and the Avengers movies, so it is fun and interesting to compare how the comics differ from the MCU. In total, I think I wrote around 42 spreads, which is 84 pages, if I remember correctly. There was so much material to write that I spent several months writing 7 days a week from the time I got up till the time I went to bed! And then another couple of months working on daily batches of image captions, diagrams and text revisions or additions. What is your favorite entry within this book and why? That’s hard to say because there are so many—and partly because I can’t remember everything I wrote! Captain America and Spider-Man are among my favorite characters so I really enjoyed working on all the spreads related to them. But I also like working on characters that I’m not familiar with so I can learn something new. What approach did you take when researching this book? Did you need to reference original comics for this? If so which ones did you need to refer to the most? Writing a book like this is really more like running a marathon. It’s all about staying on schedule and completing a substantial amount of work every day. Each day I had to write an average of 1500-2000 words, and all of it had to be researched that same day. I consulted a wide variety of things—particularly DK’s own Marvel reference books, as well as online Marvel Wikis and fan sites for cross-checking and tracking down sources. I used Marvel Unlimited’s online comics library and occasionally retail sites to check dates and issue numbers. Throughout the book we have Key Moments spreads that cover important stories in the timeline. This required me to sit down and read whole mini-series for particular Captain America and Spider-Man story arcs. What is your favorite character or section to work on and why? I like Spider-Man because he’s definitely Marvel’s most relatable, every-day human character, despite his amazing powers. Also Captain America is a good old-fashioned patriotic hero; an archetype that’s maybe even fallen out of fashion in our contemporary pop-culture. Did you learn anything new by working on this project? I learned so much! The thing about Marvel is we are approaching a century of comic book history. It’s impossible for any fan to know everything—maybe even impossible to know everything about some of the long-running characters themselves. So much of the material is actually new information to me too! And that’s one of the most rewarding thing about writing—is the ability to learn along the way—and something I strive to do no matter what the subject matter is. Is there anything else you would like to share about Ultimate Marvel? What sets this book apart is that it covers everything in chronological order, as the characters, locations, weapons and technology were introduced in publishing. And the book is full of timelines. So it gives fans a very good picture of how everything fits together and when events occurred. The best place to find me is on Twitter and Facebook: @AuthorAdamBray. I also have a website at www.AdamBray.com, though it’s a bit out-of-date at the moment. Thanks again Adam for a wonderful interview! 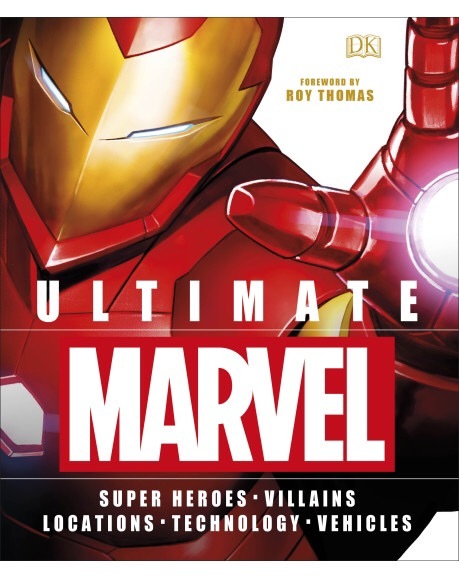 Ultimate Marvel is the definitive in-world guide to the Marvel Comics Universe featuring, in chronological order, every significant Marvel Comic character, location, vehicle, and weapon in the company’s history. This reference book is available through the following online retail sites: DK Books UK, Amazon.com, Amazon.ca, Amazon.co.uk, BN.com, Books A Million, Indie Bound, Indigo, McNally Robinson, Waterstones. The Adventures of the Everyday Fangirl welcomes author Adam Bray to talk about his latest project for DK Books, Marvel Absolutely Everything You Need to Know. Welcome Adam to The Adventures of The Everyday Fangirl and thank you for taking the time out of your busy schedule to answer these questions about this recent project. What was you first introduction to the Marvel Universe? My earliest memories of Marvel are from watching the Incredible Hulk TV show with Lou Ferrigno, and the Spider-Man cartoons in the 1980’s. I loved the cartoons, but it always seemed like the same two episodes were playing every time I turned it on! Who is your favorite Marvel character and why? Spider-Man! I think it’s probably because of the life-long connection I have with the character since my early childhood, and of all the Marvel characters he’s arguably had the most spotlight, so he is the most familiar. Peter Parker as a characters is so relatable. He deals with real-world problems in addition to his more fanciful superhero challenges. What is the story of how you were approached to work on Marvel Absolutely Everything You Need to Know? This is my first Marvel book. I’d been wanting to branch out to Marvel for a long time, so I was thrilled when DK asked me to join the team of authors. I’d already co-authored a Star Wars book with the same format, so DK was happy to have someone on the team who already had experience as we figured out what works best for the “Absolutely Everything You Need to Know” books. What kind of research did you have to do for this? Lots! Months of it! I was surrounded by DK reference books, Marvel comics and the internet, reading all day long about each of the characters, teams, objects and events that I wrote about. One of the things I enjoy about writing any book is the opportunity to learn. And I learned SO MUCH while researching and writing this book! All things Spider-man, for the reasons mentioned previously. Captain America was probably a close second. His sort of pseudo-historical background tie-ins (as it relates to world war history) is fascinating, and it’s nice to have an old-fashioned patriotic American good-guy. Those are becoming less common in entertainment media these days—so oddly, it’s actually very refreshing! Ultron was also really fascinating as I learned more and more about him. He’s a complicated character! Who inspires and encourages you to continue to work as a writer? Ultimately it’s my own internal drive to keep working with this great material, be creative and make my own contributions, and develop my career as a writer. But I look to the other authors and artists making Marvel comics, as well as the teams making great Marvel movies. Their creativity, art and achievements inspire me to keep going, and give me lots of great material to work with. The same is of course true for Star Wars too! Is there anything else you would like to share about Marvel Absolutely Everything You Need to Know? It’s a very fun book, and it will appeal to any fan, regardless of their age, and whether they are new to Marvel, a casual fan or a life-long expert. Marvel content is so vast that nobody can know everything, so there’s lots for anyone to learn within the pages of our book! It’s full of countless fun facts, trivia, and all the essentials to get a well-rounded foundation regarding Marvel’s characters, teams, artifacts and events. Marvel Absolutely Everything You Need To Know is packed with fun facts, bizarre-but-true tales, and quirky insights into everyone’s favorite Marvel comic characters, including The Avengers, Spider-Man, and Daredevil. Discover why the Hulk comes in three different varieties—green, gray, and red—and how a frog once gained Thor’s powers! 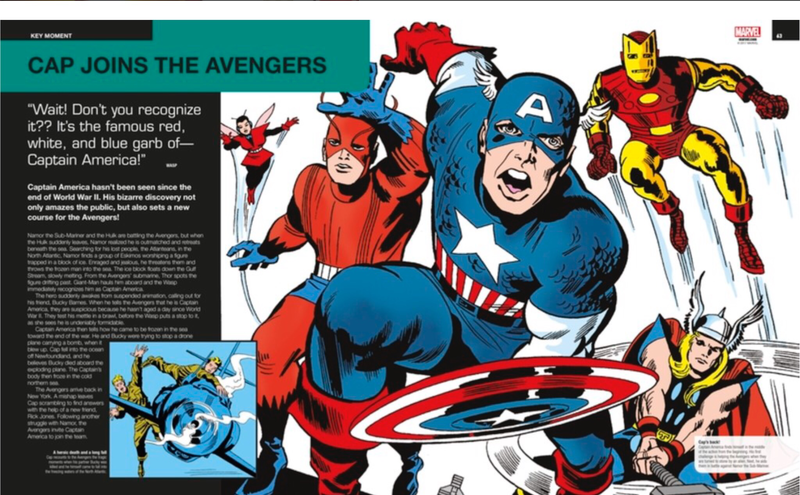 This unique guide sheds light on the most fascinating corner of the Marvel Comics Universe, from secrets of the Super Heroes to the making of Marvel’s finest and strangest comic moments. From behind-the-scenes revelations to strange and interesting facts, Marvel Absolutely Everything You Need to Know will surprise and delight new and die-hard Marvel fans. Available now via Amazon, Barnes and Noble, Books A Million, Indiebound, Walmart and other retailers. Welcome to a new series of interviews with Fanboys who Support Fangirls. 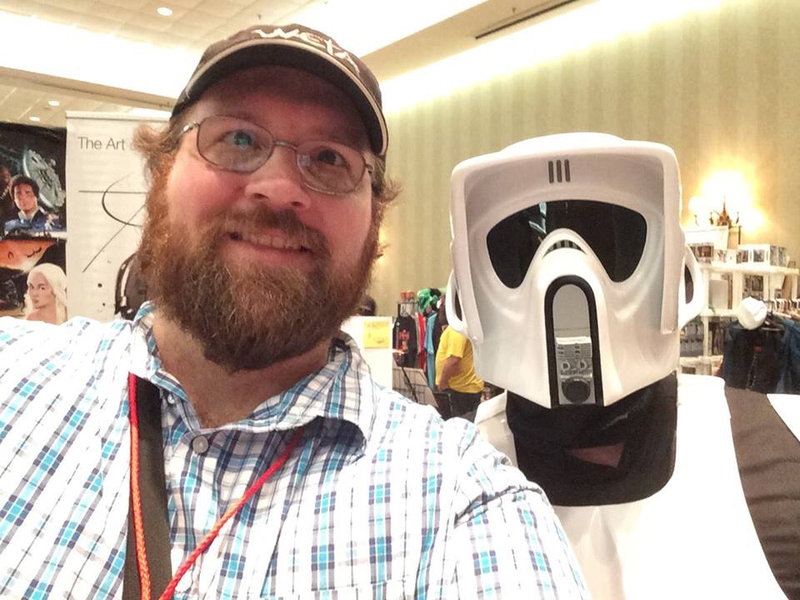 Today, The Adventures of the Everyday Fangirl interviews Author, StarWars.com contributor and of course Fanboy, Adam Bray about his efforts to support Fangirls like myself. Thank you so much Adam for stopping by The Adventures of the Everyday today to let us know more about you and about your efforts to support Fangirls! What fandoms are you a fanboy of and for how long? Actually, I’m a big Middle Earth geek! I’ve spent a lot of time in New Zealand, been to two of The Hobbit premiers and many of the big premier parties, met many of the cast and crew, and visited the film locations. I’ve even been to the Hobbiton film set two or three times now! I probably own two of everything sold at the Weta Cave shop by now as well! Of course, Star Wars and anything from Lucasfilm has been a life-long passion. However, on a more casual level, franchises like Farscape, Star Trek, Aliens and anything from Pixar. When did you first learn about Fangirls? Probably through Ashley Eckstein and Her Universe, and the ladies at the Fangirls Going Rogue podcast. Who are the Fangirls you support? Of course, I really admire Ashley Eckstein and all her achievements. Her talent, creativity, entrepreneurship and leadership skills all make her a great role model for anybody. Vanessa Marshall too, for all the same reasons. I’ve recently discovered artists Jenny Dolfen and Ksenia Z (Lorna_ka). And I’m a fan of all the podcasts that Johnamarie Marcias, Sarah Woloski, Teresa Delgado, and my co-author Tricia Barr create. What do you do to support Fangirls? Inclusion is important, as is encouragement. I make an effort to help promote projects of female fans and colleagues, and share things that I think will be of interest or a useful resource for them. Social media is a focal point for me in many things. It’s how I get the majority of my information anymore, so I stay up-to-date with what female fans and colleagues are doing that way. It’s also a primary way I help spread the word about what they are doing—whether that is new announcements for podcasts, books and blogs posts, or new artwork and products, or even film and television projects. It is important to encourage your friends and the people whose work you admire, so I try to intentionally help given them a social media boost when I can. Anything else you want to say to others about being a Fanboy who supports Fangirl? I think it is important to stay positive. It’s easy in fandom and social media to slip into criticism or get territorial. But generally if you encourage and support others, they will usually do the same for you. None of us wants to be surrounded by negativity. So, I’m not perfect—I make lots of mistakes—but on social media now I try to stick to positive comments as much as possible. That old saying, “If you don’t have something nice to say, then don’t say anything at all,” is so wise! Promote the things you like. Don’t waste time talking about the things you don’t—unless it is something really important—something worth the consequences. But always try to think about what you say before you say it—how it will impact other people—and does the thing you want to post actually align itself with your purpose for being on social media in the first place? Will it draw negative or positive responses to you—and is that something you want to deal with the rest of the day? That’s an important thing to practice when dealing with anyone, whether male or female fans. Thanks again Adam for joining us today! You can follow Adam’s efforts via Twitter or via his website, http://www.adambray.com.